From the opening images of “Sweetgrass” — gorgeous stills of rural Montana and then a dreamy sequence of sheep eating in the snow — it’s obvious that filmmakers Ilisa Barbash and Lucien Castaing-Taylor want to tell a story unfettered by familiar documentary techniques. There is no narration in this 101-minute movie, no soundtrack, almost no explanatory titles and long stretches without dialogue. What there is are sheep, approximately 3,000 of them, bleating, grazing, scurrying, giving birth and dying under the watchful, often fed-up gaze of their cowboy caretakers. Barbash and Castaing-Taylor, who are married and have day jobs at Harvard University, stumbled upon their subject matter while living in Colorado. They heard about a family of Norwegian American sheep ranchers in Montana, who are the last to drive their sheep into the state’s Absaroka-Beartooth mountain range — a perilous trek that takes months to complete. 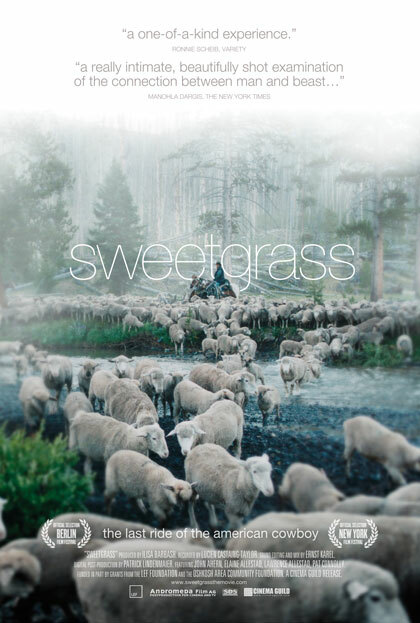 “Sweetgrass” emerged from 200 hours of video footage shot over eight years. The film has been hailed by critics for its beauty, intensity and elegiac storytelling. Q: What compelled you to make a documentary about Montana sheepherders? Barbash: All of our films are interested in conflict. And in each case, we try to probe deeper than journalistic documentaries usually allow… With “Sweetgrass,” the presence of sheep on top of a mountain in a designated wilderness area is troubling to some environmentalists, but it has been a part of human tradition for millennia, and a part of the Absaroka-Beartooth range’s history for more than 100 years. We ask viewers to engage more deeply, and less polemically, with issues they assume they already understand. Q: Why did you make the sheep the main characters? Castaing-Taylor: Why not? Think about sheep for a second; people never do. We tamed them in Mesopotamia 10,000 or so years ago — they were the first livestock animal ever domesticated by humans, and gave us our first staple proteins, milk and meat. A few thousand years later, initially in Persia, we started getting wool from them. The whole conquest of the New World was funded by sheep — by Spanish taxes on merino wool — and Columbus brought Churrp sheep here on his second voyage, in 1493, and Cortez again in 1519. British prohibitions on exporting sheep to America and on importing wool from America were factors leading to the American Revolution… And sheep were, of course, a major player in the American West. Cattlemen called them “range maggots” as they competed for grazing and water. Q: Why did you make the film without narration? Barbash: Rather than seeing this as denying the viewer information, I like to think of the film as respecting viewers enough to ask them to experience the images and sounds for themselves, without too much of a mediating presence. If we’d told everyone that this was Pat and John, they are cousins of English-Irish descent, they work for Lawrence, whose Norwegian American family has been ranching in the area for four generations and that this is not going to go on much longer, you’d spend the whole time watching the film, thinking, “OK, now that’s Pat, and that’s John, and that’s typically English-Irish, and what’s going to happen to make this perhaps the last sheep drive?” Instead, if you trust us — and that’s a big if — you sit back and you almost literally ride up into the mountains and go on a sheep drive. You see and you hear how hard it is, for the sheep and for the people, and you know intuitively why it may not go on forever. Q: Describe the filming of the three-month trek over the mountain range. Castaing-Taylor: French filmmaker Jean Rouch talks about going into a cine-trance when filming. He means that when you film, you become absorbed in the whole process to such an extent that you are virtually in a trance. Of course, I didn’t feel that way every moment I was up in the mountains, but being a part of such an enormous undertaking was an amazing experience for me, a parochial kid who grew up in Liverpool. I couldn’t believe there was anywhere in the lower 48 that remote. And the work is so hard for everyone that you hardly want to wimp out because your feet hurt. I didn’t realize it at the time, but I had worn out all the cartilage in my big toes by carrying around all this heavy camera equipment in the mountains. But I wouldn’t give up that experience for all the cartilage in the world. Q: What do you want viewers to come away with? Barbash: I think one of the most gratifying things I have heard people say is that they never thought that they could be so transported by a film about sheep. It’s frustrating when one goes to screenings of documentaries where the filmmaker is present and everyone just wants to know about the content of the film. What happened to the people? How big was the town? Filmmakers also want people to look at their work formally, stylistically. It’s gratifying to us when spectators ask themselves what it is about “Sweetgrass” that gives them the intense cinematic experience that they would expect to get from fiction, but not documentary. And if they feel that they’ve been privy to an amazing part of American culture that they never knew existed, and that it’s sad (if not sentimentally so) that it’s basically over — that’s more than enough to come away with, no? A Cinema Guild Release | © 2009 All Rights Reserved | sweetgrass@me.com.